Questions? Reach out to one of our experts! Here at Foundant, our success is based on making your life easier. Designed from the ground up as a web-based Fund Accounting system dedicated to the unique needs of community foundations. 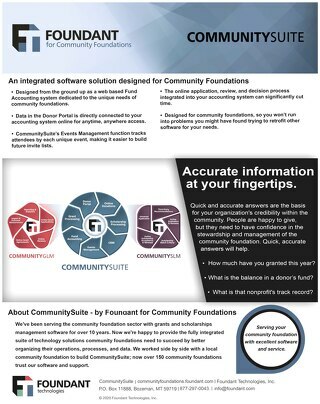 CommunitySuite is a complete software solution specifically designed to address the unique challenges and activities of community foundations. Meet the Team that partners with you to ensure your Community Foundation Success. 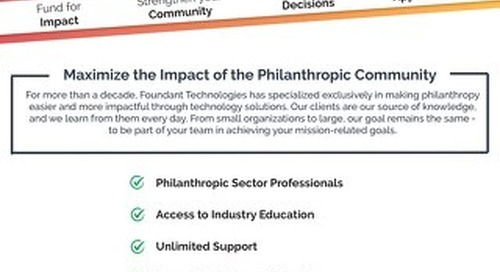 Foundant Technologies has specialized exclusively in making philanthropy easier and more impactful through technology solutions.